On Thursday all eight of the Kindergarten classes performed their little program. The kids worked so hard on learning all the songs and movements and they did a wonderful job performing. They are definately ready for the first grade. Joseph was so excited that Dad, Mom, Grandma, Grandpa and Nana all came to watch him. I was a little disappointed that Joseph's class was standing on the gym floor and you couldn't really see him at all. After the performance Joseph showed Grandpa and Nana around his classroom and then Ms. Klee handed out certificates to all the kids. 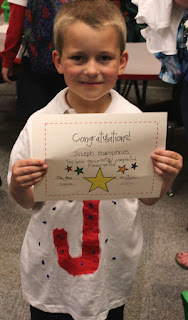 It is so hard to believe that Joseph is finished with Kindergarten, but he has grown so much this year and learned so many new things that I know he is ready to continue on and see what first grade has to offer him. Once the celebration at school had ended we all headed over to Red Robin for our own graduation celebration which included fries and milkshakes of course. Showing Grandpa and Nana his classroom. On Friday it was Joseph's first official field day. The school did a wonderful job with all the stations they had set up for the Kindergartners and it was great because only the kindergartners were having field day on Friday. The weather was just perfect with enough sun that it kept you warm and a cool breeze to keep you from being to hot. Joseph had so much fun with his classmates running, throwing the noodle javelin, face painting, kicking the soccer ball, bouncing on the bouncy slide, playing volleyball, dribbling the basketball and bowling. When Joseph finished up at field day I took him to lunch at Red Robin and then we came home and played for the rest of the day. I am so glad that Ben and I were able to go and cheer Joseph on. Let the games begin with sword fighting. Joseph and his buddies being silly. Joseph and Lexi. He was so excited that Lexi was helping. Aidan and Joseph. They crashed more then they stayed on their feet. Bouncy slides are the best!! Everyone loves a Popsicle break!! So earlier this month Ben had a business trip to Chicago and Joseph and I were bummed to be without him for the weekend, so to keep ourselves from crying the whole time he was gone Joseph, Grandma and I had a weekend of fun. To start the weekend we picked up an ice cream cone on the way home from the airport. Then on Saturday we started our day with a pancake breakfast at IHOP, followed by painting pottery which was really, really fun, then it was onto bowling and we all had a really great first game but then we all stunk up our second game. When we finished up bowling we came home to relax for a bit before we headed out to go swimming. I was surprised at how packed the pool was, but we still had a great time!! I was ready to call it a night after swimming but we still had one more activity on the list, so we quickly showered had some dinner and then went to see the new Disney movie Chimpanzee. It was a wonderful day with my mom and little man. On Sunday we rested, went to church and picked Ben up from the airport. We were so happy to have Ben back home safe and sound. Yay mom got one to!! A few weeks ago my cousin Cindy came to Denver for a visit and it was so nice getting to see her and spend time together. It has been ten years since I have seen her and so it was really nice having time to reconnect. While Cindy was in town we went by the house that we used to live in when I was younger and Cindy was living with us out in Acres Green which is better known today as Park Meadows. Then since Cindy is so interested in architecture we headed downtown to check out some of the awesome buildings and other fun things. It was a great little trip and we can't wait for Cindy to come back. My old House. It has changed so much, I barely recognized it. Cindy, Me and Mom at our old place. Back at the big blue bear. It is a must to see the bear when you visit Denver. I had a wonderful Mother's Day. We started the day with a yummy waffle breakfast, a light lunch and then headed over to church. All the talks and lessons were just wonderful and just what I needed to hear. After church the boys made mom and I an absolutely wonderful dinner, it was strange to just sit and let them do all the cooking but well worth it. The boys hit a home run with the meal they prepared. Our first course was Salmon and grilled peas with an out of this world flavor, I could have filled up on that but knew there was more coming so I paced myself. Our main course was Elk steak that was also incredibly seasoned and so tender it would just melt in your mouth and potatoes made by Joseph that were also super yummy. The boys rounded out the meal with an Oreo ice cream cake with fudge Oreo's on top!! It was a prefect way to end the day and make mom and I feel so special. The boys did such a good job with this meal, that we may have them cook more then once a year. :) I hope all the mother's and grandmother's I know had a wonderful day. Joseph helping Collin with the salad. He added the whole bag of Crasins!! Our chef for the night. He did an incredible job!! My mug from Joseph, I can't wait to use it. Our appetizers were grilled Salmon with green peas. Ben had the best flavor on the fish!! It is so fun to be waited on. My awesome husband!! He sure knows how to spoil me. Main course of tender Elk steak and potatoes. Dessert! Oreo ice cream cake with fudge Oreo's on top. Well since Joseph has discovered a new love for Lego's and last weekend was Lego Kids Fest in Denver we went for a family fun night. We went down on Friday night and I am glad we did, it was the only session that wasn't sold out and it was still packed!! They had so many cool activities for the kids to do like Lego car racing, a coloring station, a reading nook, ninjago battles, vacuum racing, lectures, a movie station and multiple building stations. It was crazy to see so many Lego's in one place and the models out of Lego's were incredible!! I am always amazed at what they can build out of Lego's and truly appreciate the talent that it takes, because sometimes a very detailed Lego house can stump me. Lego's anyone? This pile of Lego's was a foot and a half deep in the very middle. Lightning McQueen. I think this was every kids favorite. Anyone up for a superhero adventure? Joseph I am your father. ROAR!! This lion actually made noise when you put your head in and it was pretty loud. I had to take my picture with Captain Jack. A little moment with Harry and Hagrid. Yeah I am just chilling on the big blue bear! !